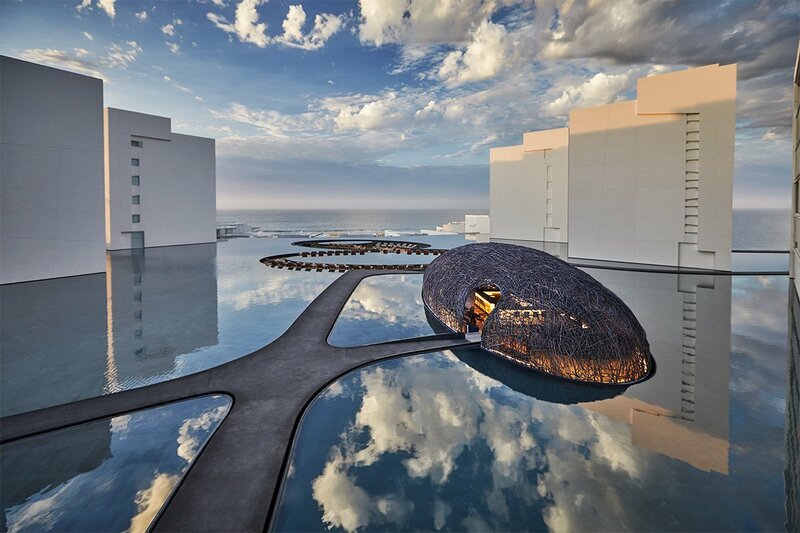 All photos courtesy of Viceroy Los Cabos. 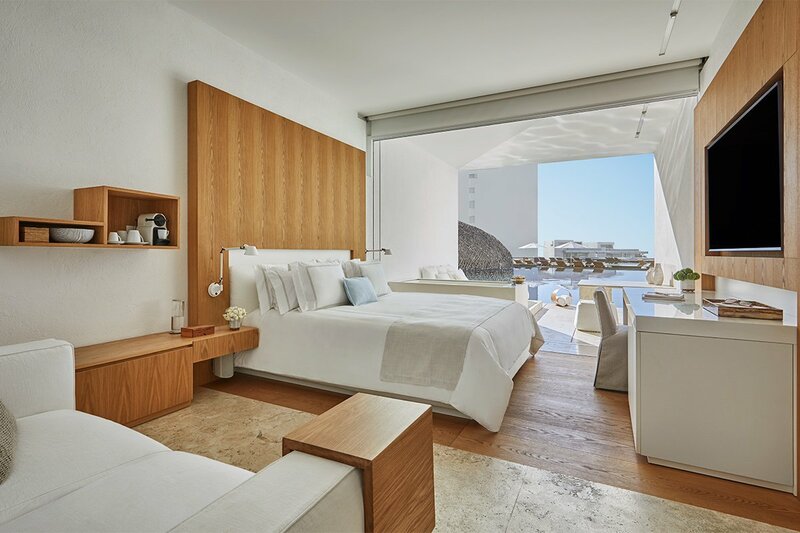 When prominent Mexican architect Miguel Ángel Aragonés designed the space that would become Viceroy Los Cabos (it started out as Mar Adentro), he had one thing in mind: the property’s stunning beachside location on the Sea of Cortez. Take one look at the stark white cubes that house the hotel’s apartment-like rooms or the latticed timber structures that encase two of its five on-site restaurants — all of which appears to float on a series of reflective pools — and the inspiration becomes clear. 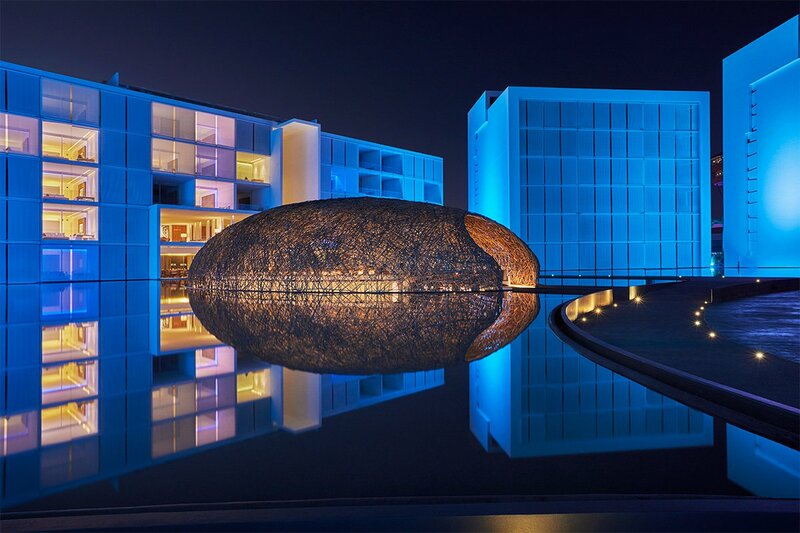 The entire hypermodern hotel is an ode to the elements, an architectural work that incorporates water, sand, and sea breeze into its very foundations. 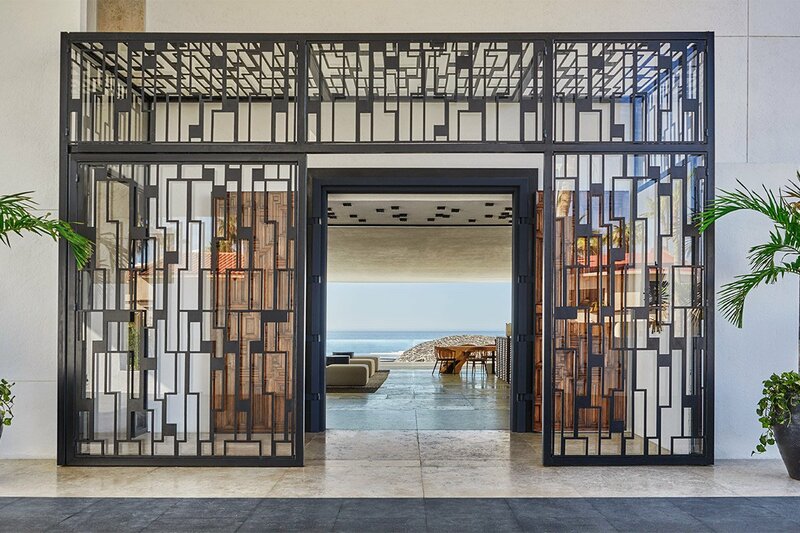 It’s one of the most unique places to stay in tony San Jose del Cabo. Nidito beach and pool bar. Style: Airy, avant-garde, and elegant, like a super-luxe hotel from another planet. 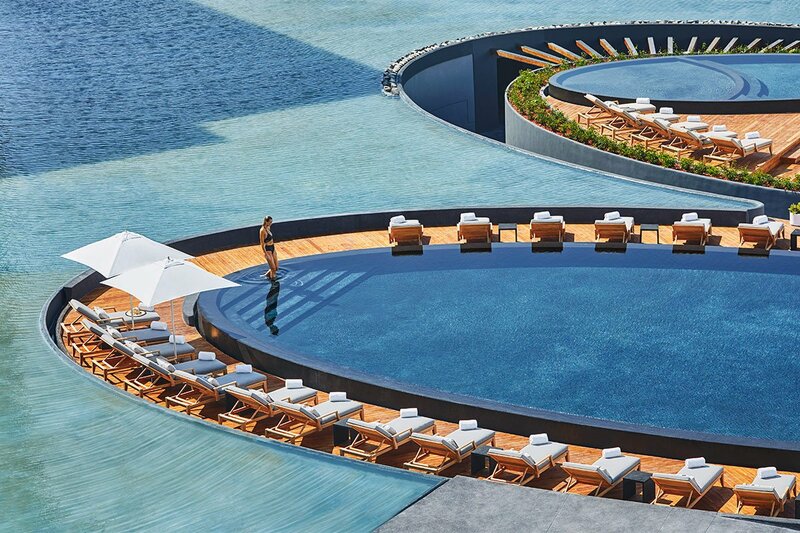 Standout Detail: The network of reflective pools that funnels desalinated, treated water from the ocean throughout various parts of the hotel. The visual effect is mesmerizing, as is the soothing sound of running water heard throughout the resort. This Place Is Perfect For: Sophisticated romantics, families in need of a posh getaway, and jetsetters looking for a better way to spend spring break. 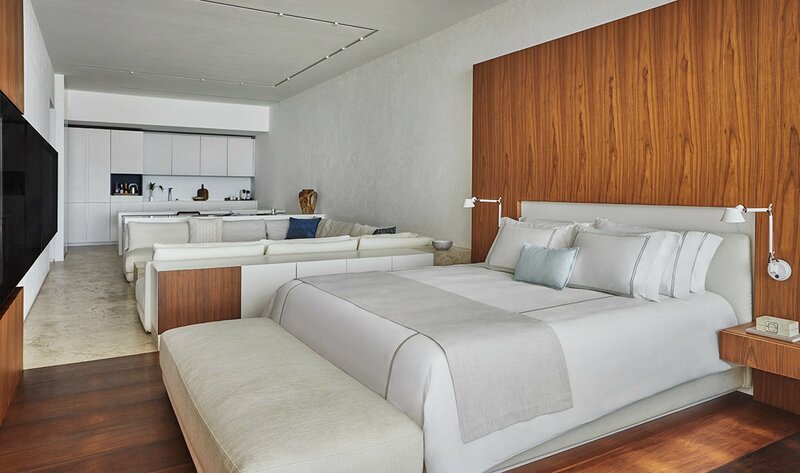 Rooms: The 192 guest rooms and suites decked out in concrete, glass, natural light, and not much else are spacious, luxurious, and minimal. Italian interiors by Poliform Contract blend seamlessly with the space, drawing the eye toward the captivating Sea of Cortez. Villas come with covered outdoor terraces; those on the top floor have sky views and private pools. 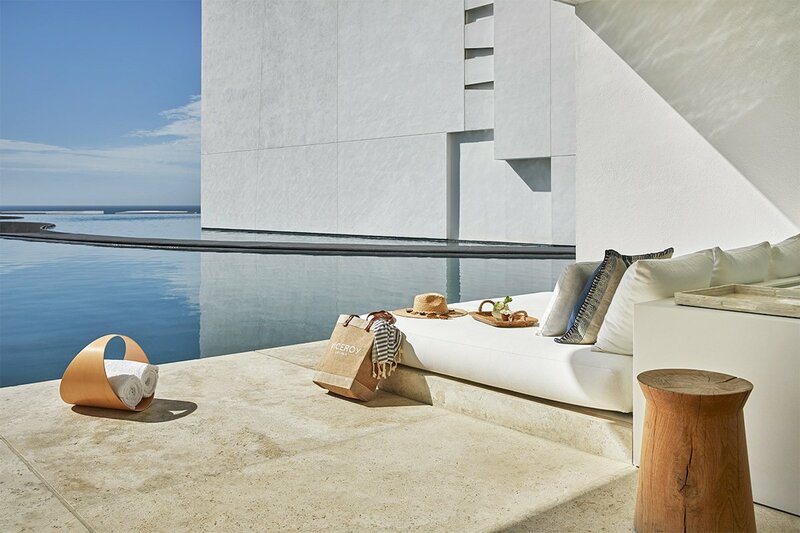 On Site: There are four stunning, stone-lined pools, including an infinity edge pool overlooking the hotel beach; a state-of-the-art, indoor-outdoor fitness center by Harley Pasternak; a full-service spa; a movie theater; a kids' club; complimentary bike rentals; and free WiFi in all public spaces. Food + Drink: Of the five on-site bars and restaurants, Nido, the Mexican-, Spanish-, and Peruvian-inspired cevichería encased in an intricate nest-like structure surrounded by mirror pools, is the highlight. 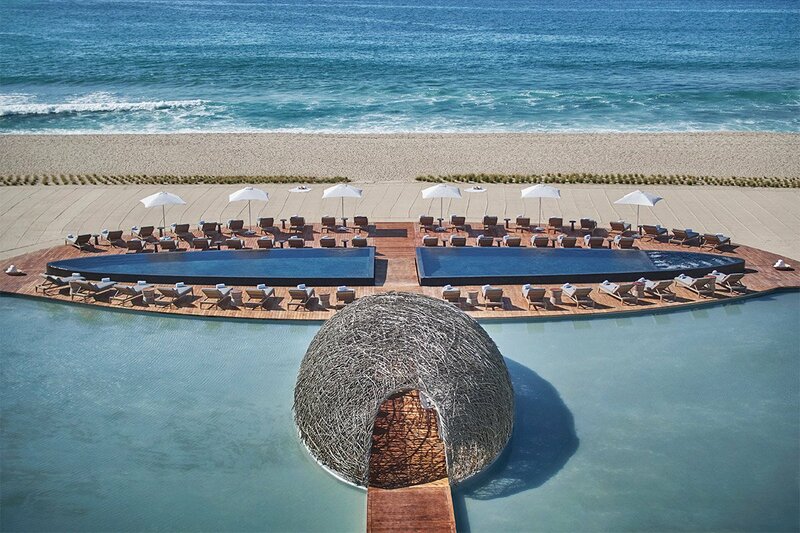 Nidito, Nido’s lively beach bar sister, shares the cevichería’s funky design. Rooftop bar Cielomar does fresh seafood, wood-fired pizzas, and cocktails, and is the place to be at sunset. Rates change seasonally and start around $325 per night. Click here for reservations, or contact the Fathom Concierge and we can plan your trip for you. Keep exploring Mexico: Pay a quick visit to Rancho Pescadero, find out why Todos Santos is the country's best kept secret, and discover Mexico's most romantic hotels. The hotel and restaurant illuminated at night. A suite with living area and kitchen. A pool-facing guest room terrace. 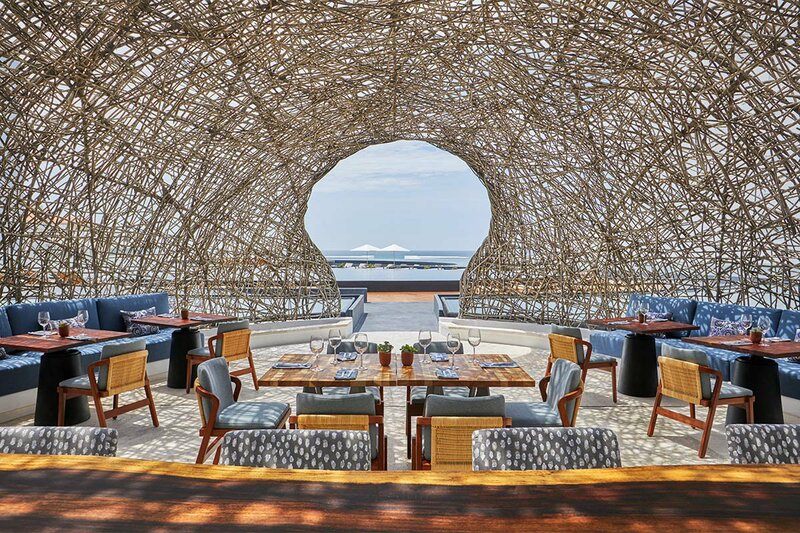 For a special meal outside the hotel, Arbol at Las Ventanas serves Indian tandoor and Asian dishes in private booths surrounded by reflective pools and lanterns and makes for a romantic dinner. Flora Farms, a farming community in the foothills of the Sierra de Laguna Mountains just outside of San Jose with a fantastic restaurant, is pure magic. Acre, the hip, younger brother of Flora Farms, is also worth a visit for a drink, a pool dip, or a walk around their palm forest. Remember those complimentary bikes? Use them to cruise around the streets of old San Jose. You’ll find plenty of Mexicans textiles, galleries showcasing local art, even craft beer at Baja Brewing Company. For a more adventurous day trip, drive out to Todos Santos.